Danni/y Rosen (front right) has been involved with the Alliance for Safer Communities (formerly known as the Sexual Minorities Round Table) since the mid-1990s and currently serves as the citizen co-chair. Submitted photo. When it comes to safety, the advancement of LGBTQ equality can be a double-edged sword. While queer folks are gaining legal protections in a number of arenas, increased visibility can lead to backlash from those who feel threatened by a change to the status quo. Progress can also lull us into a sense of complacency — as if our work is already done. Fortunately, queer folks like Danni/y Rosen have their eye on the ball. Rosen is a citizen co-chair of Portland-based Alliance for Community Safety (formerly known as the Sexual Minorities Roundtable). Rosen first attended meetings for the group, which is dedicated to working with local law enforcement to improve relations with the LGBTQ community and increase safety for all, since the mid-1990s. 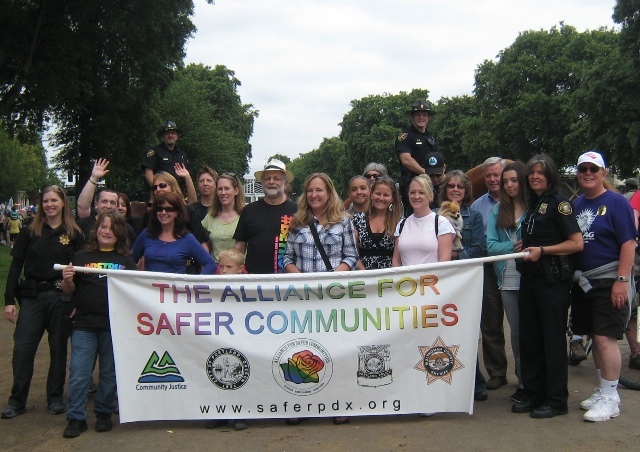 Through the Alliance for Community Safety, Rosen has had the opportunity to volunteer with the Crisis Response Team for the sexual minorities community and to sit on the Portland Police Bureau Performance Review Board, the PPB Force Review Board, PPB hiring panels, and the PPB Award Nomination Review Panel. Rosen talked to PQ about that what threats face LGBTQ people in Portland and what folks can do to make a difference. PQ: Do you feel safe as a queer person in Portland? Why or why not? Rosen: When? I think we all have a range of “safe.” Could I be assaulted? Yes, anyone can. Do I think that being queer increases that likelihood? When I first started presenting en femme in public it raised my awareness of how privileged I had been as a male. I began to view my personal safety differently. This was in the ‘80s and a very different atmosphere for those of us who were transcending the expected gender roles and presentation. There are a few places in Portland I would be uncomfortable and suspect that being queer might slightly increase my risk, but those are areas that I would consider it prudent to be more careful in general. For the most part I think our fellow citizens help keep each other safer. I would like to see an increase in those reporting being victimized or assaulted and witnesses stepping up to help prosecute those who assault others. PQ: Do you feel like Portland/Oregon has become a safer place for LGBTQ people in recent years, or do you sense a backlash? Rosen: In some ways Portland is safer; [in] other ways there is still much to do. Legal protections have increased the penalty for those who threaten LGBTQ people. There has been increased reporting and prosecutions. There is an increased awareness about LGBTQ people and due to the number of people who are “out,” many now realize that their neighbors, coworkers, friends, and family members may be LGBTQ. Has there been a backlash? I think with some. Some people are scared and those fears are fed by public discourse. When there are ballot measures or hot topics that the media is focused on it can be a catalyst to those who become bolder because of the vitriol of some articles and programs. This is why the alliance tracks historical data on hate crimes to stay aware of potential problems or areas in the community. PQ: Do you think that, in our focus on random anti-gay assaults, we lose sight of other threats to the safety of LGBTQ folks (including domestic violence, racist attacks, police profiling/brutality, anti-trans harassment, etc.)? Rosen: The short answer is yes. But more broadly it is the “news cycle” focus that I find fault with. We tend to focus on those events presented by whatever media we value. Television/radio broadcasts, newspaper/magazines, internet articles, social media circles, word of mouth — all provide an ongoing cascade of incidents. We tend to focus on the sensational, or those that most closely impact our own community or communities — we all are members of various communities and those incidents that touch on multiple relationships have a tendency to draw increased focus. Much of the violence within our society goes unnoticed or only a few have knowledge of the incidents. If you look at any of the surveys about violence or abusive behavior there is a large percentage of people reporting in those surveys about their experiences. If even a portion of these were to have the same level of attention as those we do hear about, we would be flooded. There is entirely too much violence in society. PQ: Do you think the LGBTQ community is as concerned about its collective safety as it should be? Rosen: Concerned — yes. To the point of doing something about it personally — sometimes. A few years ago, partly in response to some particularly bad incidents, a community foot patrol was started in the entertainment district (Old Town/downtown Portland). There are other community patrols throughout Portland. People sign up and take the short training or come out to shadow a patrol and then are often never heard from again. The Q-Patrol has had over 80 people indicate they would patrol. There are now about 30 members on the emails list. Each summer patrols have been cancelled because a minimum of three volunteers could not be staffed. Last year the number of patrols was reduced in hopes that coverage could be maintained for the higher risk dates. This last month the patrol during Pride was cancelled for lack of volunteers. Spending a few hours a couple of times during the summer (patrols start in May and end in October) to make a difference is important. We can often see something like the “Hands Across the Hawthorne” turnout and those collective actions are highly important. If even 1 percent of those people took a turn or two during the summer we would have patrols every weekend. Next Where have all the drag kings gone?